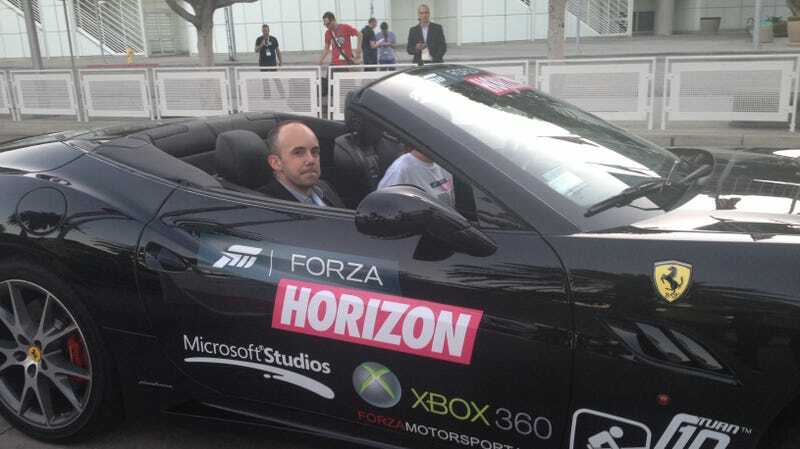 I got an e-mail over the weekend from Microsoft public relations: "I have some sweet rides available to take you to the Halo Showcase, courtesy of 'Forza Horizon' if you're interested. We're going to have four cars around for E3: a Ferrari California, a Lamborghini Gallardo, an Audi R8 V10 and a BMW 6 Series." The cars would be parked outside the Los Angeles Convention Center and I needed to go to that Halo event anyway, so... could they spare a second car for Tina Amini? Maybe one for Jason Schreier? I took the Ferrari. Passenger seat, of course. My driver was a well-tattooed race car driver. I messed up, though. I was too slow on the draw with my phone, so I failed to catch the spectacle of a man at the Convention Center literally holding a gate over his head so Tina's car could drive under it. You can see a brief glimpse of him doing it here. Unfortunately, as fun as the ride was and as unflappable as I tend to be at things like E3, I realize now I was far too self-conscious about shooting video while my driver gunned it to traffic lights. You don't get a good feel for the speed. Gunning it through the streets of L.A.? I should have shot more! I'm sure I'll be in a Ferrari again. Some day.